Ngmoco 1-ups Sony's LocoRoco with a tilt controlled and delightful video game. Last week, Sony let us play LocoRoco 2 on PSP. As much as we loved pressing the left and right triggers to maneuver those adorable blobs through their multicolored environments, we couldn't help but wish the system had accelerometer controls so we could control the little guys by physically tilting the device. 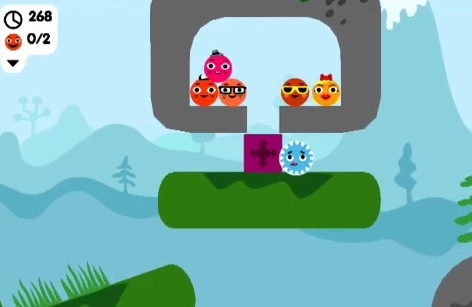 It'll never happen, but at least there's Rolando, ngmoco's LocoRoco-inspired iPhone app. Although its developers "borrowed" Sony's idea, they created an amazing and unique experience that cements Apple's phone as a portable video game system. Rolandos are multicolored and circular creatures that speak gibberish and respond to motion, so if you tilt the iPhone left, your selected Rolando moves left; you can also make it jump by swiping upwards and select more than one by sliding your finger across an entire group. There's also the Spikey Commando Rolando that attaches itself to objects, and it comes in handy for reaching different areas and hitting switches that enable the other critters to roll on their merry way. Each of the game's stages presents a puzzle for you to solve. One tasks you with guiding an out of control prince to the goal. The catch? You cannot maneuver him, so you must wedge the little guy between two Rolandos to push him forward. In addition, you'll need to make use of environmental objects like jump pads, conveyor belts (place your finger onto it and slide up and down) and even boxes (Rolandos can push them) to succeed. In later levels, you'll tilt your iPhone 360 degrees to roll a sleeping king and blow up walls with bombs. There's just a ton of variety that keeps the game fresh and challenging. Naturally, these puzzles start easy and grow progressively more difficult. Not only must you avoid spiked pits, but also spiders and other creatures that seek to kill your cute Rolandos. Timing and patience are your best friends, and we strongly suggest that you wait until enemies pass by before launching those precious little guys into the air. 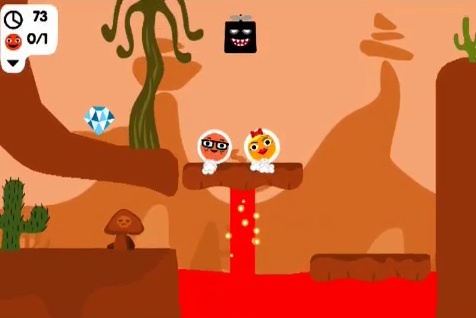 Similar to LocoRoco, Rolando features flat 2-D backgrounds and only a handful of colors per level. It's a simple looking game, but its sharp visuals look great on the iPhone's glorious screen. There's also a soundtrack full of happy beats, though we love the option to import music from our own libraries. That needs to pop up in future games. Unlike ngmoco's previous iPhone games, Dropship and Dr. Awesome, there's little to complain about. Controlling the Spikey Commando takes practice since he seems to roll in the opposite direction we instruct him to. We also noticed that things get jittery whenever we attempt to examine the entire game board. For whatever reason, sliding two fingers across the screen to view the map causes Rolando to freak out. Aside from those small issues, this is without question one of the iPhone's best apps. Sure, it looks and plays similar to LocoRoco, but this is one of the few copycat games that almost surpasses the one that it emulates. The adorable music, engaging puzzles and exquisite tilt controls will keep Rolando in your head for weeks. Kudos to ngmoco for publishing such an amazing game. We hope that a sequel is on the way. What's Hot: Reminds us of LocoRoco, has superb tilt controls, excellent puzzles, head bopping music, the ability to import your own tunes and simple yet attractive graphics. What's Not: Controlling the Royal Spikey Commando is a pain, panning the map isn't a smooth experience, costs $9.99.